Reviews and Testimonials for the Paint Estimator. Let us know what you think about The Paint Estimator. Have any thoughts, suggestions or just some feedback. Let us know by filling out the form. "All reviews are checked first before they are posted. This is to prevent spam goons"
I have been using Pat's program now for 6 months and have written almost 600 proposals. The variety of features that are built in produce extremely professional proposals/contracts which are so easy to generate. The business and cost tracking features are terrific as well as the customer data base. Honestly, I have not really drilled down to all of the programs features, but know that once I do it will make my business run more smoothly. Best feature of all is Pat himself. So responsive to any questions or needs which I doubt you would get with any other program. The value for the price is unbelievable, and it is very user friendly! Great program. I really enjoy the four different styles to write estimates. This is the best paint program for your money. I like the idea that Pat listens to our ideas and gives updates twice a year. 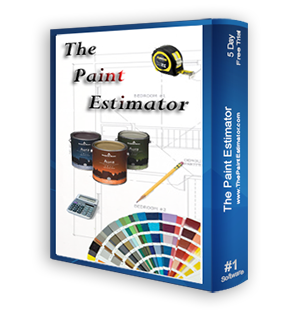 If you are a painter need a to write estimates you need to purchase this program. Thanks Pat. Best painting estimator. Easy to use. Making estimates fast and simple. I recommend it all painters. If you have questions, support is quick to help with anything you need. Hey Pat. Just some thoughts on your program. I have been using it now for about a year and a half. I LOVE THIS PROGRAM! I will, and do recommend it every chance I get. Thanks for the great job. Bob. Just introducing a new rating system to the website. I will be the first one to review this product. I give it a 5 star rating. (obviously as I wrote it) Seriously, if you could leave some feedback that would be great.